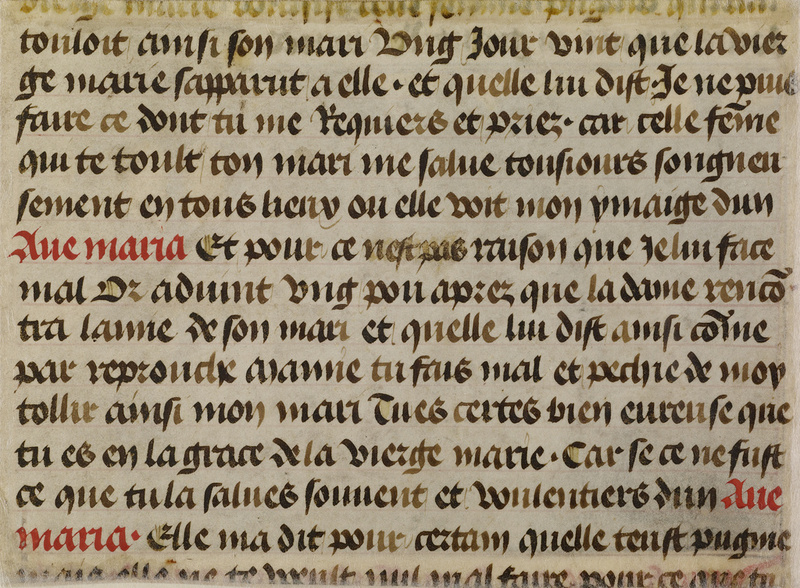 The miniature has a line of text at the top: "jours de puis en grant reverance" and another above it, now trimmed and illegible, and along the lower edge, a rubric partially trimmed but mostly legible: "Dune femme qui se mess...avecq..." There is also text from Les Miracles de Nostre Dame on the back. This miniature originally appeared in a manuscript expressly created for Philip the Good, the duke of Burgundy that consists of a compilation of accounts of the miracles of the Virgin Mary. Philip was a highly successful political leader of his day as well as an important and influential patron of manuscript illumination. The witty scene illustrates a noblewoman's endeavor to deal with her husband's Christian mistress. In the chapel at right, the wife of the adulterous knight prays for the Virgin Mary to avenge her by punishing the mistress. However, Mary refuses the request on account of the adulteress's deep devotion to her. Subsequently when wife and mistress encounter one another in the street the mistress is so embarrassed--she falls to her knees--she promises to give up the husband. Meanwhile the wayward husband cowers behind the chapel. Given the duke's own serial philandering--he fathered several dozen children outside his marriage and relatively few within it--one cannot help but wonder how he responded to this moralizing tale. The miniature is painted entirely in grey tones, a technique called grisaille, popular in the later Middle Ages. 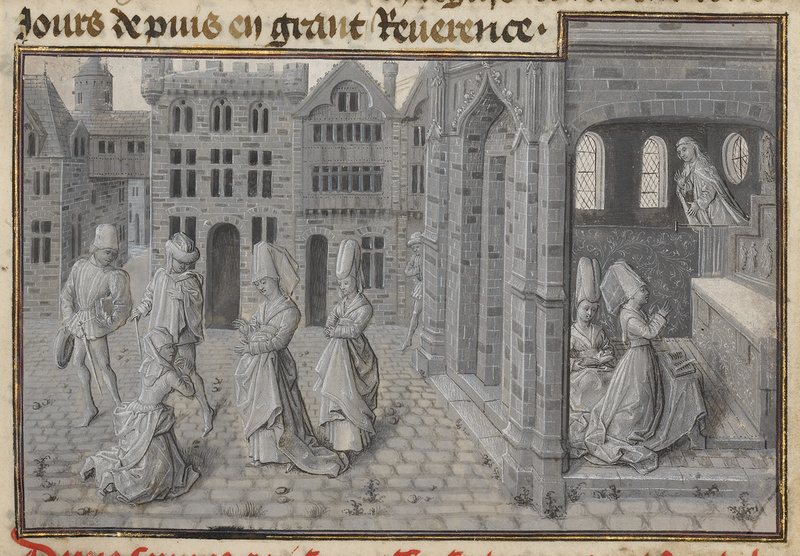 Despite the lack of color, the illuminator, Lieven van Lathem, vividly evokes the buildings and cobblestone streets of a prosperous Netherlands town such as Ghent where van Lathem, the court painter of Philip the Good, resided. Winkler, Friedrich. Die flämische Buchmalerei des XV. und XVI. Jahrhunderts (Leipzig: Verlag von E. A. Seemann, 1925), pp. 90, 193. Laborde, Alexandre de. Miracles de Nostre Dame (London: Nicols and Sons, 1885), vol. 1, pp. 33-60; vol. 2, pls.19, 84. Gaspar, Camille, and Frédéric Lyna. Philippe le Bon et ses Beaux Livres (Brussels: Éditions du cercle d'art, 1944), pp. 30-31, pls. 28-30. Delaissé, Léon Marie Joseph. Le Siècle d'Or de la miniature flamande: Le méçénat de Philippe le Bon, exh. cat. (Brussels: Palais des Beaux-Arts, 1959), no. 98, pl. 39. Christie's, London. Valuable Printed Books and Manuscripts. June 3, 2009, pp. 4-5, lot 6, ill.
Sciacca, Christine. Building the Medieval World (Los Angeles: J. Paul Getty Museum; London: The British Library, 2010), pp. 16-17, fig. 12. Kren, Thomas. Illuminated Manuscripts from Belgium and the Netherlands in the J. Paul Getty Museum (Los Angeles: J. Paul Getty Museum, 2010), pp. 16-18, 37, 64, ill.